DPPC . . . beginning and end | A balanced diet . . .
One morning in mid-January 2001, I received a phone call from then IRRI Director General, Ron Cantrell, asking me to drop by his office later that day. I had no idea what it was all about, so I was rather surprised to enter his office and find that the two Deputy Directors General, Ren Wang (Research) and Willy Padolina (Operations and Support Services) were also there. Well, to cut a long story short, Ron asked me to give up my work as head of the institute’s Genetic Resources Center (GRC) and take up a new position as Director for Program Planning and Communications (DPPC – originally Planning and Coordination). The rationale behind this was the somewhat dire funding situation of the institute then, and the almost complete lack of comprehensive information about the sources, amounts, and use of the research grants that IRRI had received. What Ron said to me was this: Mike, if a donor offered IRRI USD5 million tomorrow I wouldn’t want to refuse it, but there again I have no idea how it fits into the overall funding picture and commitments of the institute. We need someone to set up a new office whose role will be to bring some order and cohesion to this important set of activities. It appears that some visiting consultants had apparently whispered in Ron’s ear that I might be the sort of person to take on this role. Well, I had to go away and think about this, and talk it over with Steph. Did I really want to move away from my work in rice genetic resources conservation? Well, for one reason or another, I turned him down – there were several of the terms of reference that I really couldn’t go along with. About six weeks later, one of my senior colleagues let me know that the DG was still interested in having me in the senior management team, so I decided to go and see Ron and discuss some of my concerns. We managed to reach a compromise, and on 1 May 2001 I moved from my office and labs in IRRI Brady Building (where the genebank is housed) to the main administration, FF Hill Building, across the campus. While there had been an office taking care of donors and funding, I was decidedly unimpressed with what they had achieved, and saw little evidence from my first discussions with them that they would be likely to change. I had already agreed with Ron that I could make some staff changes. My GRC secretary, Zeny Federico, moved over to the DPPC office with me in May, and I began to replace and recruit new staff. One of my first objectives was to try to persuade a soil chemist, Corinta Guerta (whom I had never worked with but who had impressed me immensely when I was on a promotion panel to which she had applied in 1998) to give up her science and join me in a purely administrative role. It took me a couple of months or so, but Corinta joined me in August 2001. Corints and I set about hiring new staff for the office. Of the original staff when I took over, only Marisol ‘Sol’ Camasin stayed on as the office clerk, until September 2002. 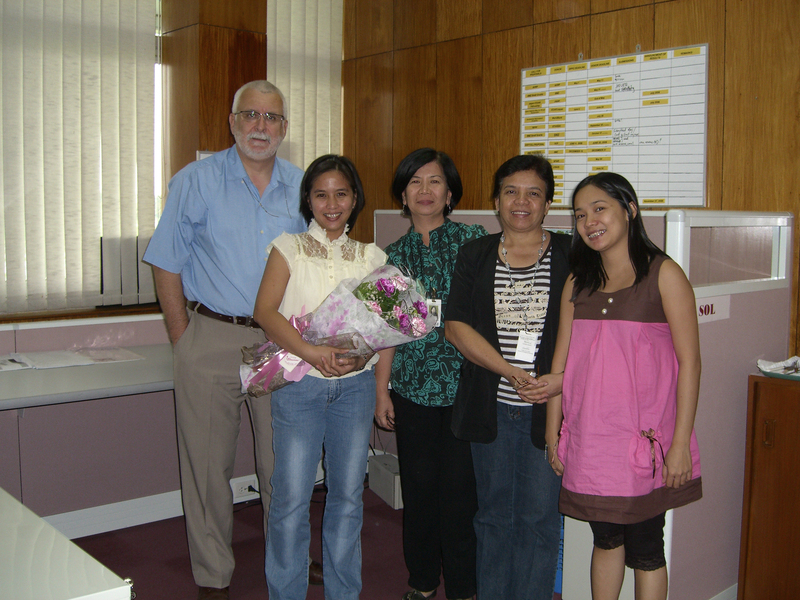 Sol was replaced by Analyn Jopia until early 2004, when Vel Hernandez joined the office on a half-time basis (shared with the DDG-Research office). Vel became full time with DPPC in April 2007. In September 2001 we hired Monina La’O as an assistant manager to help develop the donor database. She left in December 2002 to get married and moved away from Los Baños, and was replaced by Sol Ogatis. Building on Monina’s work, Sol expanded the donor database enormously, and working with Eric Clutario, a database developer, who we hired in October 2001, helped to develop in-house what became the most comprehensive project and donor management system among the CGIAR centers. 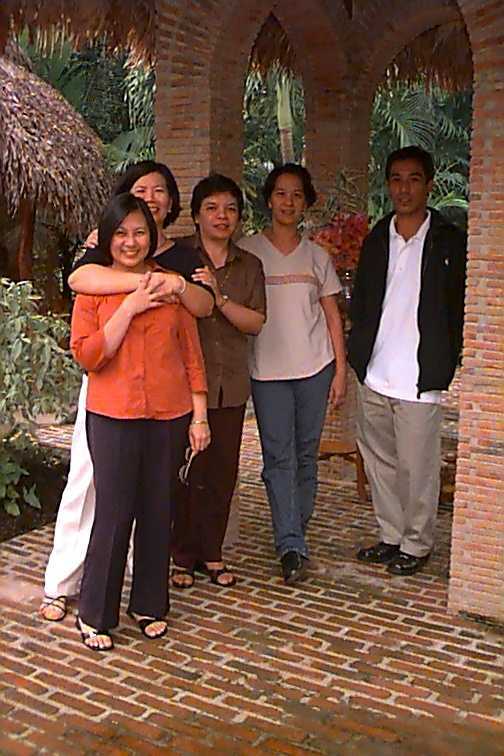 Sol also left in September 2008 to work for the US Embassy in Manila (I used to tease her that she was going to work for the CIA), and then Marileth ‘Yeyet’ Enriquez joined DPPC in December 2008, and took the project management system from strength-to-strength. By the time I retired in 2010, there were four full-time staff in the office: Corinta, who as senior manager had been my 2-I-C, assumed leadership for DPPC in January 2010; Zeny, my secretary (now Specialist-Administrative Coordination); Yeyet (now Assistant Manager II); and Vel (now Officer – Database Administration). Our database developer Eric had moved from DPPC to IT Services (ITS) in 2004 to become coordinator of Management Information Systems, but working 35% of his time for DPPC. We felt that this move to ITS would help facilitate and strengthen the links between the various information systems at IRRI and the project management system in DPPC. And it did! Corinta was appointed head of a new Office for External Relations after my retirement, encompassing the old DPPC (now renamed DRPC) as well as the Development Office, Public Relations Office, and National Programs Relations (although there have recently been – mid-2012 – some organizational changes after the appointment of a new DDG-Communications and Partnerships). In January 2012, Corinta was appointed a Director of the institute – a fitting recognition for someone who joined IRRI as a research assistant in 1975! The processes and procedures we put in place, the databases and web site we built, and the rigorous assessment of donors and funding opportunities permitted DPPC to facilitate the generation of significant funding for IRRI. We developed a close and clear relationship with the donor community, and they got to know us as well, such that we could send an email or pick up the phone and get an immediate response (or more or less). IRRI’s reputation with the donors rose significantly, and the institute moved from a USD30 million to a USD65 million organization, raising funds from a wider pool of donors including the Bill & Melinda Gates Foundation. As Director for Program Planning and Communications I also had line management responsibility for five units: Communication & Publication Services (CPS), headed by Gene Hettel from the USA; the Library & Documentation Services (LDS), headed by Mila Ramos (now retired), Philippines; ITS, headed by Marco van den Berg, the Netherlands; the Development Office, which is the philanthropy side of IRRI, headed by Duncan Macintosh, Australia; and Program Planning, headed by Corinta Guerta, Philippines, seen left to right in the photo below. 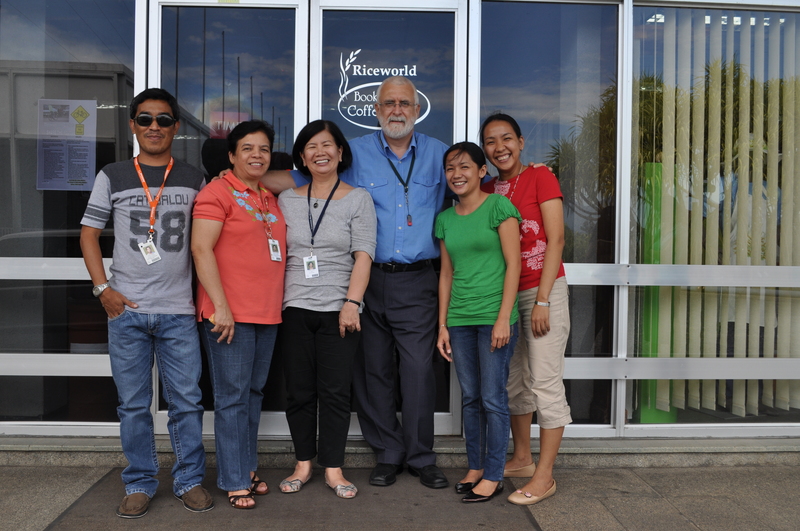 On my last day at IRRI, 30 April 2010, the DPPC staff enjoyed a last merienda together at IRRI’s coffee shop, The Bean Hub, shown in the photo below, L-R: Eric, Zeny, Corinta, me, Vel, and Yeyet. Each Christmas, we’d get together as an office group and head off to a nice restaurant somewhere, or to my home for a barbecue, to enjoy each other’s company over a meal. 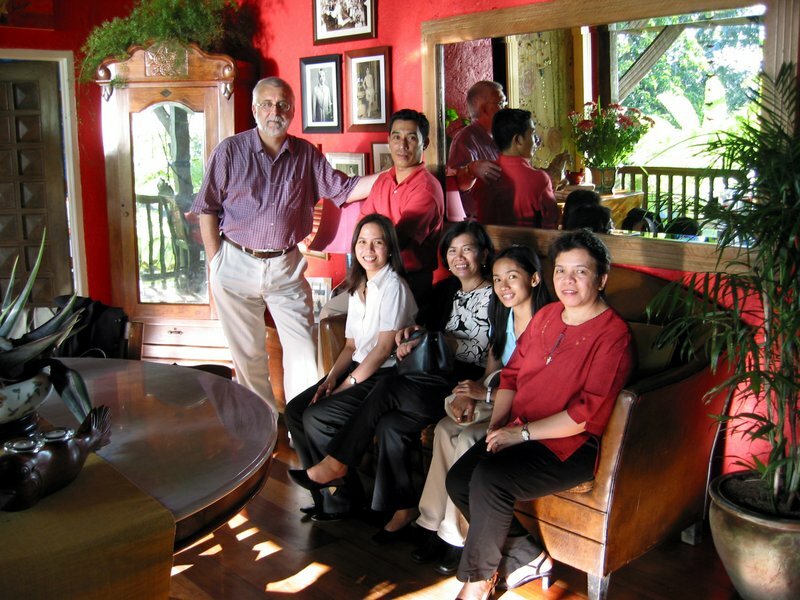 In 2004, I took the team to Antonio’s, rated as one of the finest restaurants in Asia, in Tagaytay overlooking Lake Taal and its volcano. We had a wonderful meal, and this is one of my favorite photos of the DPPC team at that time (L to R: me, Sol, Eric, Corints, Vel, and Zeny). This entry was posted in IRRI and tagged DPPC, IRRI.